For a last couple of years I was looking for a spectator sport for myself. I don’t “get” hockey and, while I enjoy skiing, watching it just makes me sad I am not out skiing myself. I tried getting into biathlon but I find the coverage to be disconnected as they are trying to cover too many people doing too many things at the same time. I love watching Winter Olympics but that is only every four years. Finally this summer I found it – dotwatching! Dotwatching is following ultra distance self supported bike races through interactive maps and social media. The two races that I followed this summer were the Transcontinental Race (this year the control points were in Belgium, Austria, Slovenia, Poland, Bosnia And Greece) and Silk Road Mountain Race through Kyrgyzstan. I kind of missed the boat on TransAm Race, but I will try and follow it next summer. These races are on the low budget side which means that there isn’t a lot of media coverage. All you get is a map with GPS signals from the riders and some pretty photographs. These races last for about two or three weeks non stop and much of the media content is generated by contestants themselves. Apart from the athletic aspect, the racers need to figure out how to get places, where to eat and sleep and how to solve problems along the way. What I like most of all is that women compete in the same category as men. Sure, there is a prize for the first woman but the challenge is the same and everyone is competing for the same spots on the rating list. If you are interested, 2015 film, “Inspired to Ride” is a good introduction to the sport. While I generally really enjoy movies and shows with strong fighting women, over time I have become weary. It is an overused trope and it is easy to do badly. In the case of Wonder Woman, where the main character and her powers are divine, the concept works well. Ditto for, say, Dark Angel where Max is genetically engineered super solder. The concept strikes me as disingenuous where mortal women fight soldiers and win by strength rather than skill or wit. 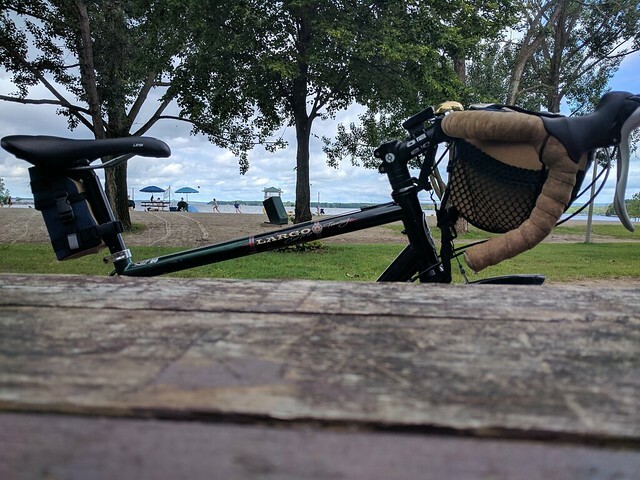 I bike a lot and try to do at least a few challenging rides over the season. Since I don’t like riding far on my own, a lot of the time I bike with men. This makes it difficult because there is no way to cover up for the difference in strength. Riding with Randonneurs has worked so far since the speeds they keep to are manageable for me. When biking with friends, I keep the directions to myself so they have to wait for me at intersections. Is Nature the one with the bugs in it? 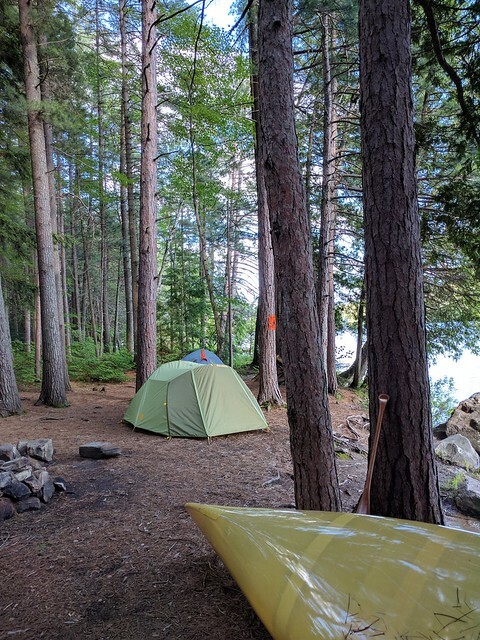 Our three camping trips in four weekends adventure concluded with a wonderful outing to Algonquin park, but let’s start from the beginning. Sometime in early June the boys convinced me to take them to the outdoor megastore and buy them fishing rods. So I did. Then they quickly concluded that we have to go fishing. 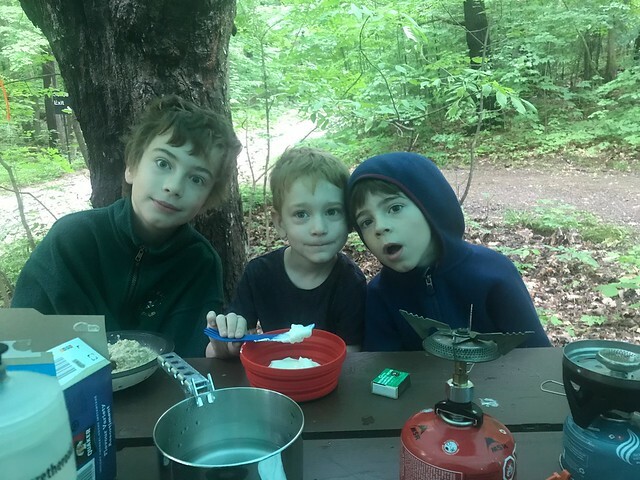 We decided to go to Gatineau Park and check out the campsite next to the yurt we stayed at this winter so we can compare and contrast. Because our primary purpose was to fish, Markus called it Camp Fishy. Our secondary purpose was to see the Lusk cavern. We checked out the cave from the outside as the water was really high so I was not comfortable going in there with Markus. We might come by later on in the season when there is less water and we are better equipped to waddle through it. We managed to avoid rain (it rained while we were sleeping) and added a short canoe ride. 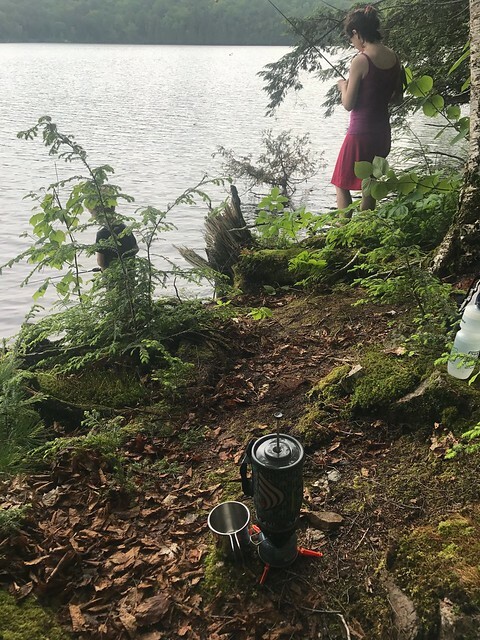 I enjoyed the camp ground by Lac Philippe but because it was rainy the fully forested sites were a little cold and very full of mosquitos. It would be a great location during the summer heat. 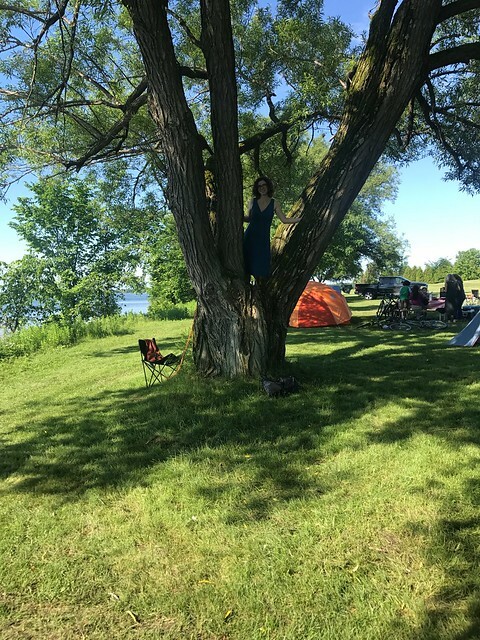 Our neighbours put together a group camping trip to Long Sault. This is the second year we’ve joined and we had tons of fun. After some hemming and hawing we decided to brave the weather and head out to camp late Friday night. We arrived at 11PM and were only the third of six families that were going to arrive that day. 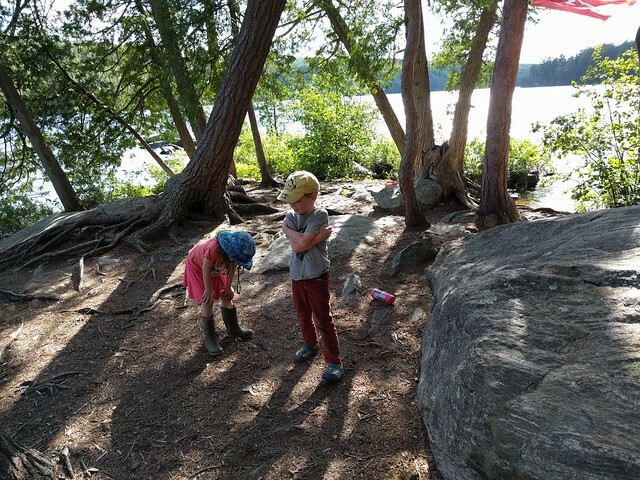 Beaverbrook camping is great for letting the kids run around with their friends and the adults chat and relax. Like last year, we visited the bird sanctuary with enough kids (eleven) no birds were to be found. 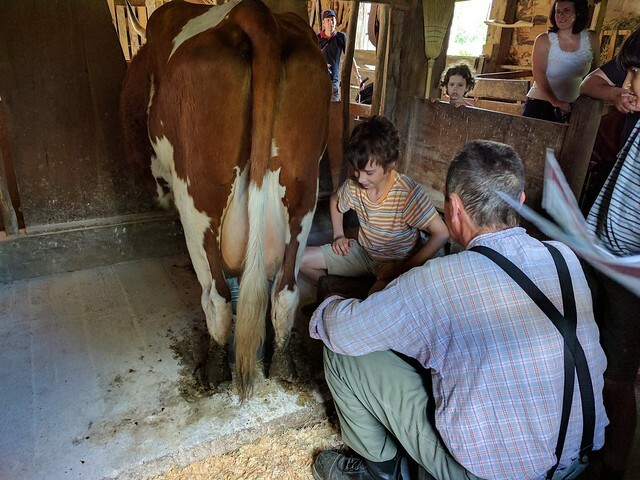 We also visited the Upper Canada Village ’cause it is there! 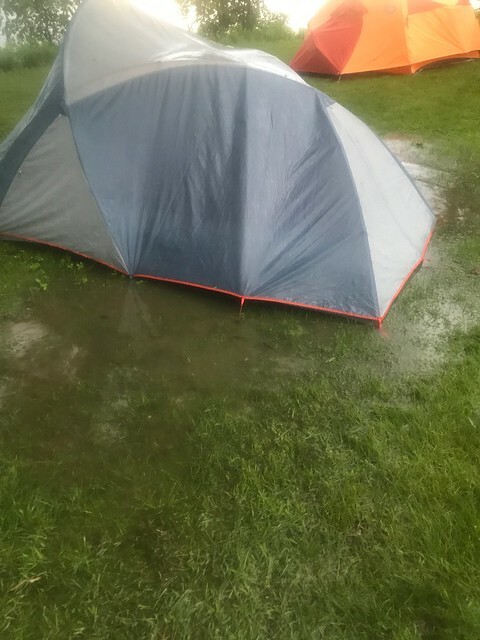 There was a pretty hilarious thunderstorm on Saturday afternoon which reminded us of the pitfalls of setting up the tent in the middle of the night. I was taking a nap during the storm and relived of the ’90s waterbed craze. 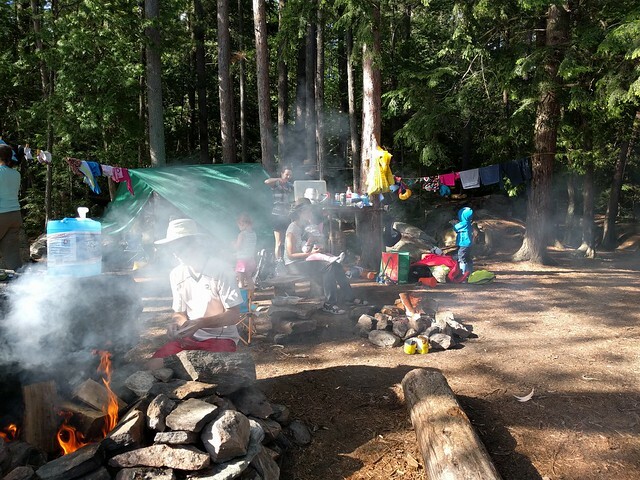 We had a lovely pot-luck and a huge campfire in the evening. I am not sure about exact numbers but I think there was about eighty people in our group. 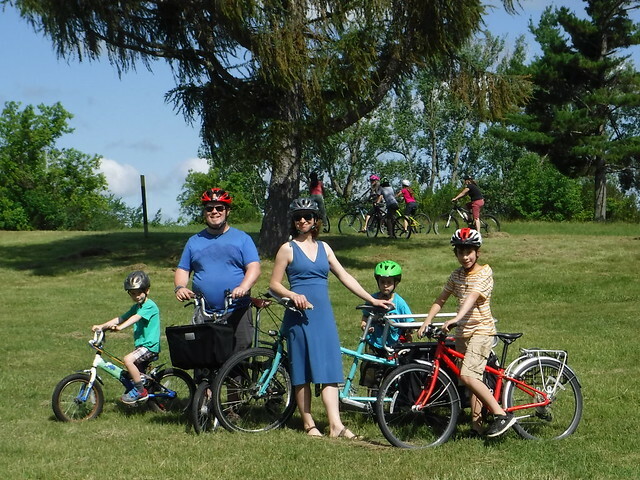 On Sunday morning we enjoyed a leisurely ride along the Long Sault Parkway. Car camping is all well and good, but nothing beats Dan’s backcountry trips. By now, Owen had broken his arm and had to sit this one out. We are assured that Chris and he had fun. 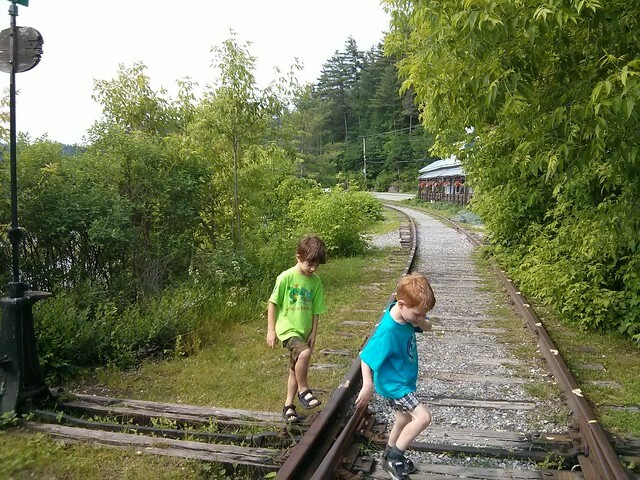 Trev, Markus and I headed out to the Algonquin Park to join three other families. 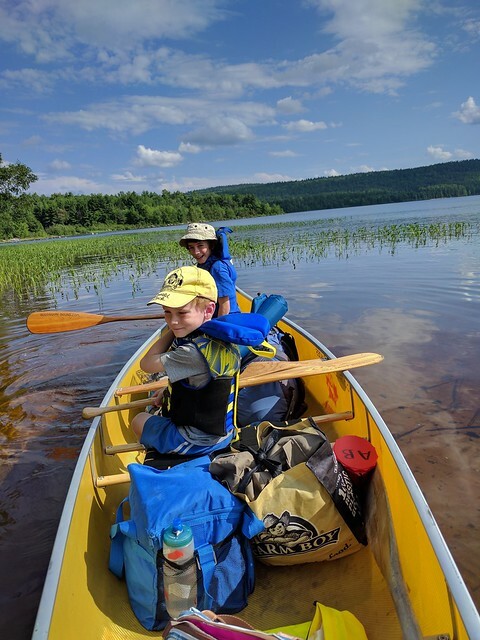 We picked up our three seater canoe at Achray and paddled from the Grand Lake to the far end of Stratton lake where our site was. Eight kids, of which mine were the oldest in the group, made for a busy picture. The visit to the High Falls was definitely a highlight. The water was too high for us to feel comfortable going down the slide, so we left that to the twenty-somethings who always seem in abundance on this spot. We found a nice pool to splash in. Despite the high water and this being relatively early in the season, the water was much warmer than last time. The trip back was made somewhat challenging by the wind. This was the first time I was steering the canoe the whole trip. Trevor did a fair share of paddling and I was pretty impressed with his stamina. I was also very happy to have such awesome friends who made canoeing with kids, which would otherwise be stressful, so much fun. I ramped up slowly last year, but this year I started too fast and needed to take some time off to recover. 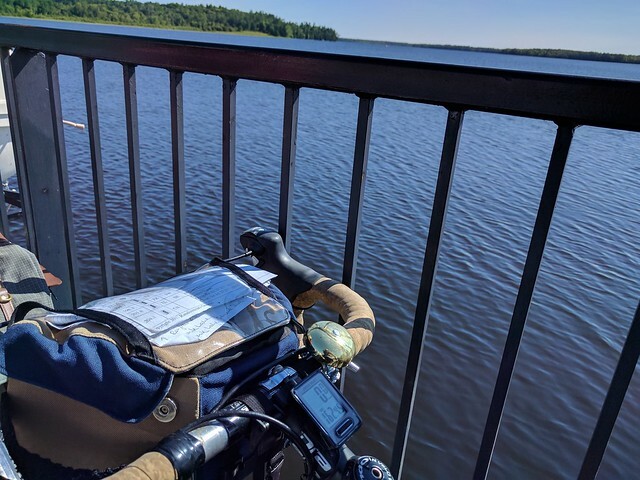 Lower mileage in May and June also has to do with my family schedule, the weather which has been of particularly rainy disposition and my preference to ride with company and all the trappings that come with that. Randonneurs’ schedule starts the second week of March (the rides, though scheduled, are not done if there is ice on the road or the weather is bad enough that no-one feels like riding). Populaires (any ride below 200km) fill up March and the first brevet (200km) was in early April. Though I had no problems with the populaires, I found the first brevet quite challenging. In the future, I will make a point of putting in a few more kilometres before getting into brevets. I’ve had some trouble with my setup. I tried out a new saddle but it did not work out and I had to put the old one back on. Also, my handlebars keep drooping! Must get this fixed and get back into form! Cup of Joe is a sort of glossy magazine kind of blog with a big heart. Joanna et co. write about beauty and fashion, families and gorgeous apartments. Occasionally they will do a piece about what to do in a new city and this is what I will reflect on today. What to do in Kanata!!! Ok, now that we’ve stopped laughing we can all agree that Kanata is only good to work in and raise kids. Not great for visiting. However, over almost two decades of living here, I have developed a proficiency in finding good coffee places to bike to. Shall I take you on a tour? What can you do in Kanata? Get out of it of, course! As of last fall, Kanata actually has a coffee shop I enjoy hanging out at. It is like we’re getting gentrified. This is the only coffee shop I have skied to, biked to and walked to. Decent coffee, nice snacks and appalling lack of bike racks. Did you know they are building a Bridgehead in Kanata? It will be a few years. For now, the Pinecrest and Golden Avenue locations are our go-tos. I slightly prefer the Golden as it is more cosy and easier to get to in that it does not require waiting at Richmond and Greenbank intersections made by urban planners who counted on people of the future crossing the roads with jet packs. Back to Bridgeheads; good coffee, good snacks, good racks. A little Ottawa jewel on the Eighteenwheeler Riviera. Someone had a bright idea to turn an eyesore cargo distribution centre into a trendy urban hotspot and it works really well. I try to get to Art-is-In as soon as it opens to avoid the crowds. It is amazingly easy to get to by bike and just the right distance. Croissants there are essentially butter floating in air. We’ve been to two cafes in Old Chelsea, both nice though I wish there was a place there that served breakfast or at least sandwiches early in the morning. Biking through the Gatineau hills makes me hungry enough to eat a full meal once I sit down. There is a place at the entrance to the Gatineau park that looks promising, but last few times we were there much earlier than it opens. My favourite place in Wakefield is Le Hibou. This place is soooooo cute! I found it a bit fussy to get to but mostly because I am not used to biking downtown. I am sure if we went more often and I got used to the roads around it, it would be fine. Must go more often then! Now we are getting into the outdoor gym that is rural west Ottawa. Alice’s is where I learned the hard way that Portobello burger is only 0% meat. 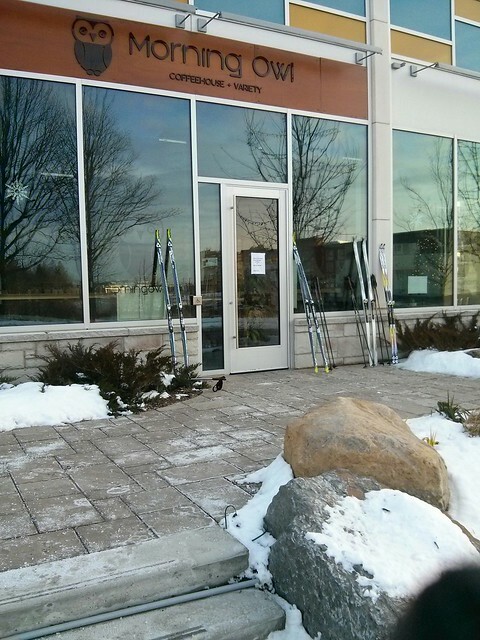 Quitters is in Stittsville just off the Trans Canada Trail. Good for both snacks and Canadian Content as it is run by a retired rock star. Nice sandwiches and good music. 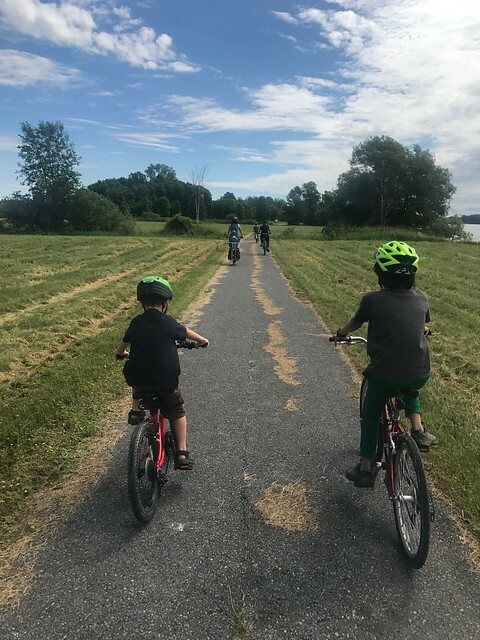 Continuing on the Trans Canada Trail past Quitters will get you to Carleton Place. 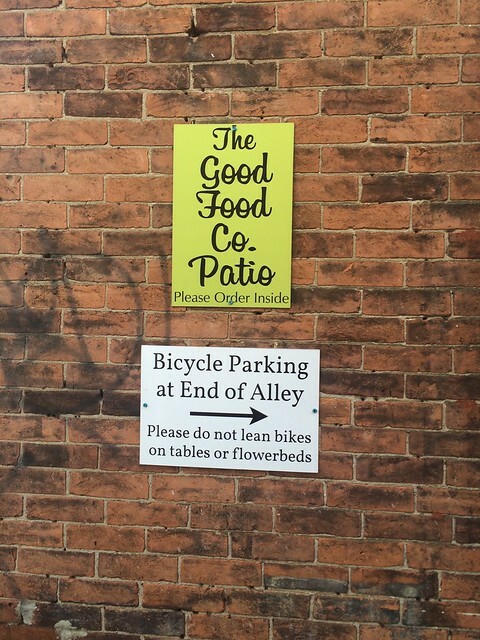 We visited Good Food Company this summer after many years of absence. 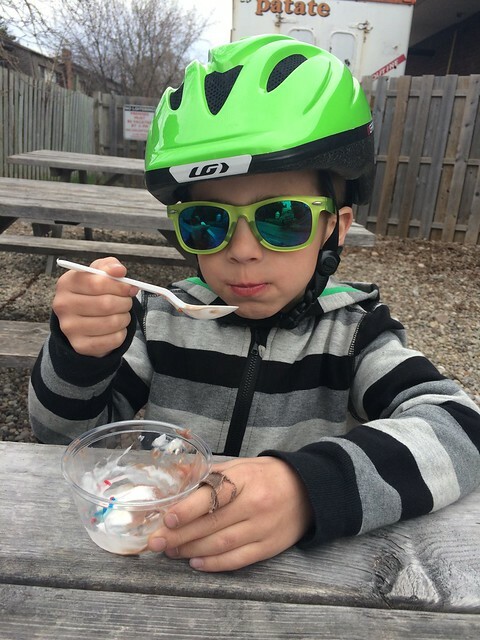 Much like Potatbello burgers are not meant for bonking omnivore cyclists, cozy cute diners and toddlers don’t mix. It is nice to be back. Or just stick around in Beaverbrook…. Lovely Bicycle talks about elegant bicycles and the bike-oriented lifestyle. Also knitting. I particularly enjoy it because it covers everyday commuting and sport in equal measure. It is intelligent and relevant to my own lifestyle. One recent post discusses how cold weather causes the cyclist to slow down and questions the possible reasons for this effect. For me, there are two slow downs in a regular season. The first happens towards the end of September. Whether this is because I have to use energy to bring up the temperature of the air I breathe or because I am getting fed up with sports cycling at the end of a good season or something else entirely I don’t know. By now I have come to expect to slow down which could be another reason for the slow down itself. At this point so I don’t even know how to prove or disprove any of these hypothesis or even show that I am actually slowing down as the temperature drops. The second slow down is much more easy to pinpoint and diagnose. 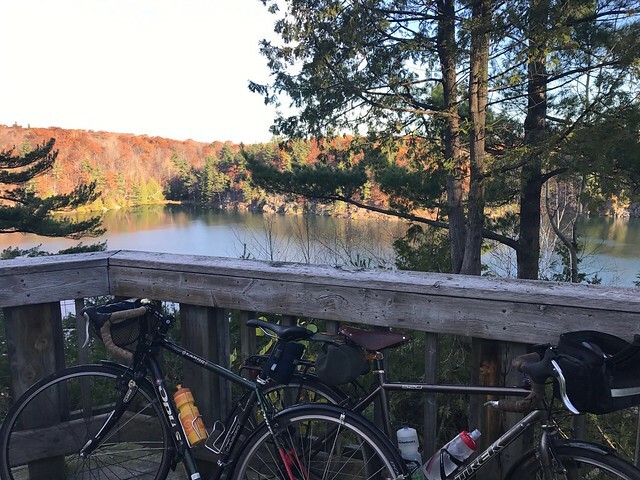 Towards the end of November, early December, the air becomes so cold that biking at my regular early fall speeds will give me an ice-cream headache. 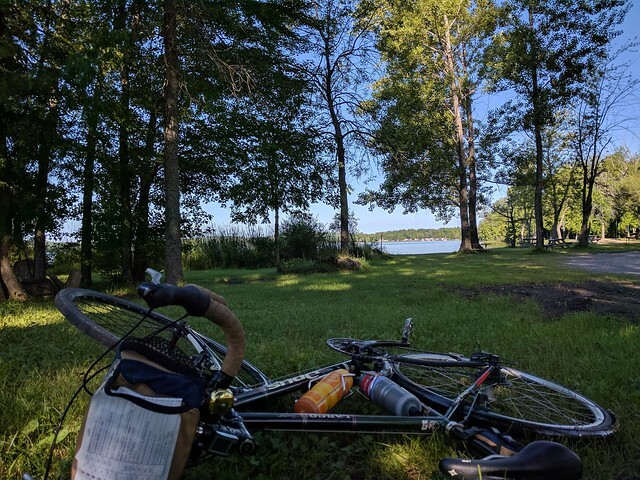 It takes me about a week or so train myself to bike gently enough so the air has time to warm up and not make my head hurt. I call this period the ice-cream headache week. This season I actually had the pleasure of a second ice-cream headache period as I returned from balmy Croatia into -20C Kanata. Fortunately, I remembered to power down quickly and I only had to suffer the headache for a day. We have had an unseasonably mild January which made my fat bike commute pretty good thus far. I have only taken the bus two or three days since the first serious snow came down. 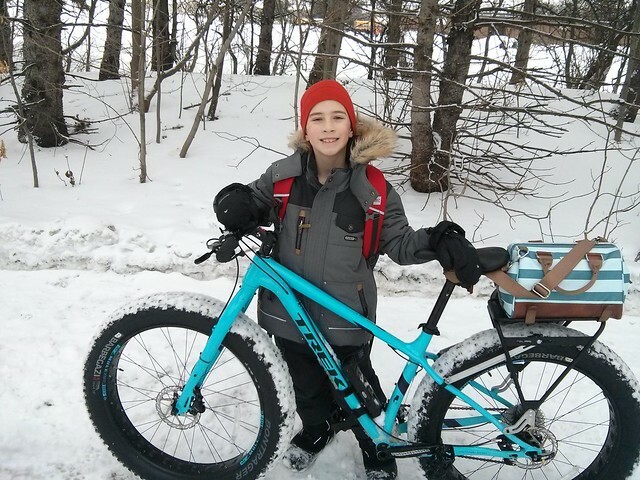 Getting a fat bike is a bit of luxury. You pay two or three times as much for the bike as you would for an equivalent regular one only to pickle it in salt and grime for four months of the year and ignore it for the other eight (or at least I expect I will ignore it). Even if you account for the money I would otherwise spend of winter fitness (say, spinning classes) or transportation (monthly bus pass or tickets) the cost per ride is high. However, this is the first year that I am riding every day, something I was not able to pull off with my original winter bike. Somedays the conditions of the trail are rough with deep snow and sunk in footprints. The ride then becomes very technical or as we would say in non biking terms, difficult in a crummy way. 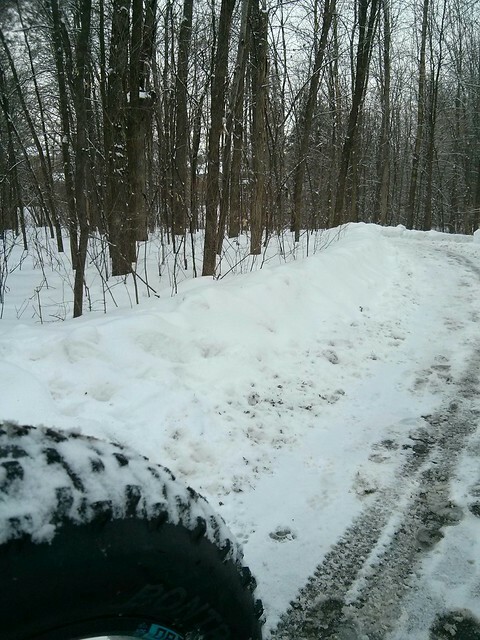 Those days I wonder at the people fat biking on the weekend for fun – what’s wrong with you!!! But then, with more gentle snow and constant traffic the potholes get filled out and the fluffy snow piles straightened out. On those days all I say is Whhheeeeee!!!! !